Welcome to video four of the Lead Guitar Quick-Start Series. In this lesson, we’ll be learning the major pentatonic scale, which is very versatile and used in many music genres. We’ll also go over a muting technique in this lesson, so you can play a clean sound with every note. You’ll remember in the G major scale shape, there are seven notes repeated in multiple octaves. In the major pentatonic scale, we simply take two of those notes out of each octave. Essentially we’ll play the G major scale, but leave out the fourth and seventh note out. Penta stands for five, meaning the pentatonic scale is a five-note scale. This scale shape will feel more even as you play it because there are two notes on every string. As we jump into this new scale, remember the universal guitar playing tips I’ve given you in other lessons. On the low E string, you’ll start with the G root note, which is your second finger on the third fret. Next place your fourth finger down on the fifth fret. You should be pretty comfortable with this since it’s no different from the beginning of the last major scale you learned. Moving to the A string, put your first finger down on the second fret, and then skip to hitting the fifth fret with your fourth finger. Take some time here to get the first four notes of the scale down, and remember to play the scale both up and down. Next up is the D string, which is the same pattern you learned with the notes on the A string. First finger on the second fret, and then fourth finger on the fifth fret. Remember that watching out for repeating patterns in your scales will help you learn the scale shapes. With the G string, start with your first finger on the second fret, and now use your third finger on the fourth fret. Now add these two notes to the rest of the scale to get comfortable with all the notes so far. Remember that you don’t have to get this down during the video – you can take a few days or weeks to get comfortable. It’s easy to finish up the scale from here, because it ends with another repeating pattern. The B and the high E string are going to follow the same pattern. Play your second finger on the third fret, fourth finger on the fifth fret on the B string, and then repeat those notes on the high E.
As you start to play this scale shape over again, you’ll notice that you need to use your pinky finger a lot. Chances are your pinky finger is not very strong yet, but you have to strengthen it at some point, so now is a great chance to work on it. What’s awesome about the pentatonic scale is it always sounds good when played over the corresponding major chord. You can hear this in the video when I play this G major pentatonic scale and the major G chord together, it sounds great. As you become a stronger lead guitar player, you’ll need to learn some muting techniques. Being able to avoid the ringing noise of other strings you didn’t mean to play will help separate you from the average lead guitar player. As I play an example in the video, you can hear the ringing from open strings and it doesn’t sound very clean. There are two ways of muting the strings you’re not playing, and the first we’ll look at today is using your fretting hand. In the first lesson we talked about good finger posture and coming down on the strings with the tips of your fingers, but this won’t always be the case as a lead guitar player. If the tip of my finger is straight down on the E string, then I will lightly brush up against the A string too. Now if I accidentally strum the A string with my picking hand, the A string will be muted and won’t sound out. You can use this muting technique with every finger as you play through the scale, and this will help prevent any strings you accidentally hit from ringing out. In the next lesson, we’ll take a look at the other muting technique using your picking hand. Now you can pull up the same jam track from the last lesson and practice your major pentatonic scale shape. Get comfortable with the scale shape, emphasize the root notes, and then try creating your own licks and solos from the pentatonic scale. You can also start to mix in the G major scale from the third lesson, and go back and forth between the two scales. Check out my example in the video to hear what it will sound like, and then have fun trying it out. In the next lesson we’ll learn the minor pentatonic scale, which is quite possibly the most popular scale among guitar players. 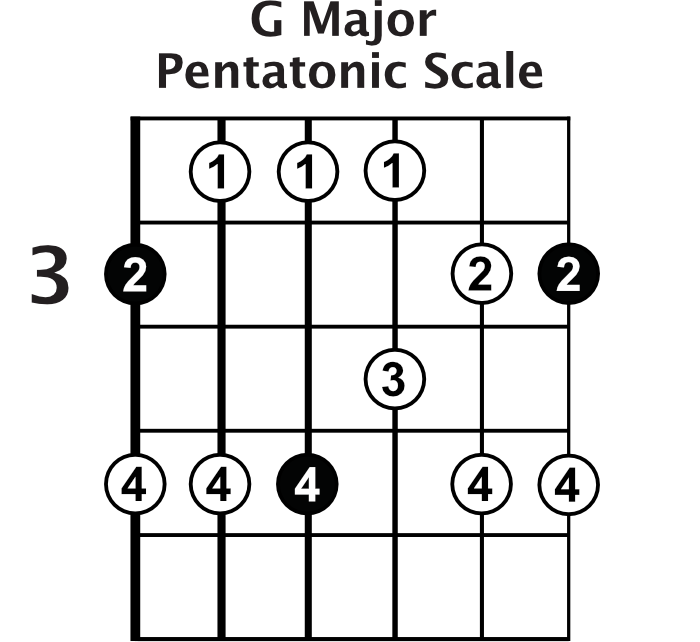 If you have any questions on the major pentatonic scale before you move to lesson five, be sure to comment below.